The property was built in 1930 and was formerly a house and shop. The spacious accommodation would lend itself to use as a B&B or for a large family. There is an attached 2 storey office which could be used as a gîte (subject to planning) or for someone who wishes to work from home. The roof was replaced approximately 20 years ago. Viewing is highly recommended. The property is midway between Vire and Flers (both a 20 minute drive) which both offer all major facilities, including daily trains to Paris, close to a small pretty village. The small medieval town of Tinchebray with shops, bars, banks, schools, doctors' surgeries and Vassy are about 5 minutes drive away. The ferry port at Caen Ouistreham is 1 hour's drive, 1 1/2 hours from Dinard, Cherbourg is 1 1/2 hour's drive and Calais is 3 1/2 hour's drive. The airport can be reached in under 90 minutes. 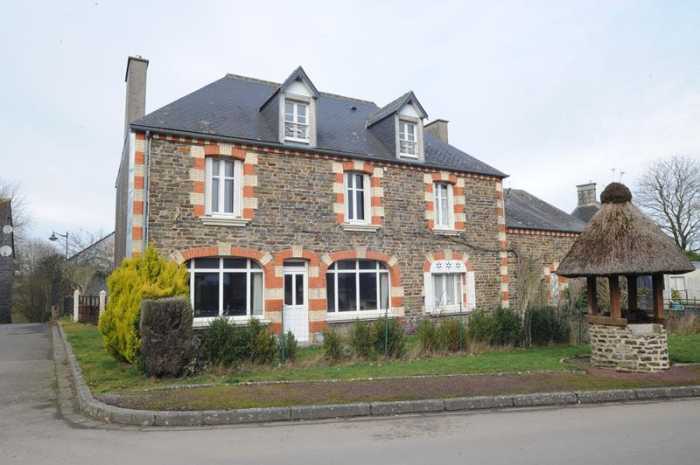 It is located within easy reach of Mont St Michel, the D-day Beaches and Bayeux. Kitchen 4.13 x 2.58m Tiled floor. Partly glazed door and side panel to porch. Range of matching base and wall units including display units. Worktops and splash-backs. Telephone socket. Sinks with mixer tap. Space for upright fridge/freezer. Space for free standing cooker. Space and plumbing for washing machine. Lounge 4.04 x 3.01m Window and partly glazed door to front elevation. Tiled floor. Radiator. Bedroom 1 4.35 x 3.05m Window to front elevation. Radiator. Marble (working) fireplace. Study/Snug 4.80 x 3.57m Fireplace (working) with grate and fireback. Radiator. Laminate flooring. Window to rear elevation. Storage Area Built-in cupboards. Laminate flooring. Inner Hall Laminate flooring. Partly glazed door to porch. Stairs to first floor. Bathroom 3.46 x 3.36m Window to rear elevation. Radiator. Tiled floor and walls. Linen cupboard. Bidet. Corner bath with mixer tap/shoswer fitment. Corner shower. Twin vanity unit with mirror and with over. Bedroom 2 3.84 x 3.31m Window to front elevation. Marble fireplace. Bedroom 3 4.35 x 2.52m Window to front elevation. Radiator. Large walk-in wardrobe. Bedroom 4 3.36 x 3.35m Window to front elevation. Radiator. Marble fireplace. Bedroom 5 4.52 x 3.39m Window to rear elevation. Radiator. Marble fireplace. Study 1.89 x 1.49m Window to rear elevation. Radiator. Door to stairs to loft. Bedroom 6 4.64 x 4.00m Velux window to rear and window to front elevations. Sloping ceiling. Bedroom 7 4.09 x 4.00m Velux window to rear and window to front elevations. Sloping ceiling. Small enclosed garden laid to lawn to the front of the house. Boiler Room Boiler. Tap. Basement under 4.33 x 2.73m Laminate flooring. Radiator. Office 6.48 x 3.45m Window to front and rear elevations. Radiator. Electrics. Tap. Stairs to first floor with cupboard under. Attached Building (used as Garage) 5.94 x 3.19m Constructed of block under a tiled roof. Sliding metal door. Oil storage tank. Wood Shed 6.10 x 3.74m Double doors to front elevation. Access to loft storage over. Fully enclosed walled garden with solid oak double gates. Variety of fruit trees including apple, pear and Victoria plum, Grapevine. Block and corrugated iron Barn 17.00 x 7.07m Part slate/part tiled roof. Large sliding garage door. On 2 levels. Access to loft storage space. P:ower and light. Mains water, telephone and electricity. All water septic tank. Gas fired central heating. Broadband internet connection.